The BV-1 is a very stylish mic. It's not cheap, but the price is reasonable given what's included. Beautifully made and good-looking mic. Flexible multi-pattern design. Lovely rich sound. Heavy. Pop-shield isn't adjustable. Multi-core could be longer. 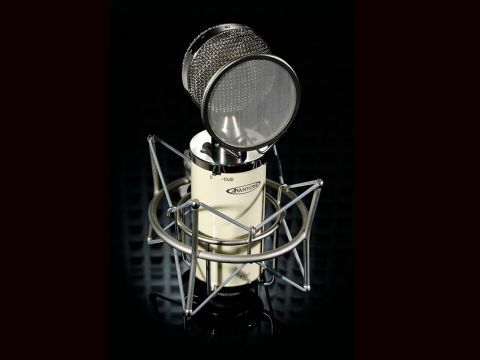 Avantone has carved out a niche for affordable mics ranging from ribbons to large capsule condensers, and with all mics getting the once-over in the US prior to shipping, quality is excellent. So by their standards, the BV-1 multi-pattern valve condenser marks a bit of departure, not only because it's quite pricey, but also because final assembly is done in the United States. Given these facts it's perhaps fitting that it arrives in a Fender-esque tweed case. And with the inside sporting a deep red furry guitar case style lining, you've got to hand to them - overall this really looks the business. The mic and power supply are finished in the same gloss buttercream colour and both the mic box and the mic itself are stamped with the serial number. As you'll have spotted the BV is a lollipop style, and includes an integrated pop shield that screws neatly into the neck section. The capsule itself is a dual diaphragm edge-tapped design mounted on four isolators behind a large twin-layer grill, and a nine-position notched knob on the PSU handles pattern selection. Further features include body-mounted pad and low-cut filter (10dB and 6dB / octave at 80Hz respectively) and you also get a quality Gotham multi-core cable. Finally, the mic includes a US-made CineMag output transformer and a Russian-made 6072A low-noise valve. Multi-pattern mics offer plenty of flexibility but also a bit of headache when it comes to spec, so maybe it's no surprise there are no response charts included. In the central cardioid setting, our first impressions are that the BV-1 isn't excessively bright, and we're really sensing a solid, gutsy low mid-range with plenty of proximity on vocals. Switch right to omni mode and you get a real sense of the mic's natural tone. But for us the best setting is the slightly wider cardioid settings either one or two notches towards omni, as these reduce the proximity and nasal nature slightly. If your room acoustics and isolation considerations allow it, this has to be the way to go with the BV-1. In terms of sensitivity, the BV-1 delivers 18mV/Pa, and we certainly noticed the mic gain drifting up for acoustic guitar (which sounded lovely and rounded). Also the 18dB noise figure isn't amazing but not rare for a valve deign. Without a doubt the BV-1 is one on the best-presented mics we have ever tried, and when you consider the price, that's quite a complement. However, there are a few things that did bug us. Firstly, although it looks cool, the pop shield sits too close to the capsule and you can't adjust it, so for us this would stay in the box. Secondly, in an ideal world, we'd want a longer multi-core so we could get the PSU out of the way. Thirdly, this mic is heavy (1.3kg) and needs a strong mic stand, so bear that in mind. Finally, both the cradle and the pop shield give off resonant rings when you tap them. Not the end of the world, but worth knowing before you ruin a perfect take. These points aside, the BV-1 is really rather nice and should deliver plenty of trouble free service while making your studio look more stylish.